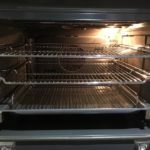 Our fully trained and insured staff use ONLY non-caustic, non-toxic products within your home and spend around 2-3 hours putting the “SPARKLE” back into your oven. First, we take all racks, trays, seals and any other removable items and place them in a solution within the specially designed, heated tank in our van. While they are soaking we scrub the remainder of the oven using a harmless organic paste. Finally everything is re-assembled and polished, leaving your oven with that showroom “SPARKLE”. The Oven Valet is a member of the Association of Approved Oven Cleaners. To arrange an appointment please call 01330 823079 or 07920 483233, or you can send us an email to arrange a time for us to call you with available dates and times. We are an independent, family run business based in Banchory, serving Aberdeen City & Shire that aims to provide a first class cleaning service whilst minimising the cost to you. We specialise in cleaning the following appliances. Can’t believe how clean Watson has got my oven! It’s like new! Going to look at it not cook in it tonight! Haha! Fantastic job today. Thank you so much. My oven looks more like the set of Strictly now – so sparkly! !